Humam Khalil Abu-Mulal al-Balawi, a Jordanian doctor, killed seven CIA operatives and a Jordanian in a suicide attack. Washington (CNN) -- The suicide bomber who killed seven CIA officers and contractors and a Jordanian intelligence official in Afghanistan was within seconds of being searched by two security contractors when he detonated his explosives, a former intelligence official with knowledge of the incident told CNN on Tuesday. On December 30, the two American guards, who worked for Xe Services -- formerly Blackwater USA -- approached the passenger side of the red 4-door sedan where bomber Humam Khalil Abu-Mulal al-Balawi was sitting, the official said. Al-Balawi had been invited to the base to share information he claimed to have that would lead the United States directly to Ayman al-Zawahiri, al Qaeda's second in command. The sedan was waved through the normal security checkpoints to get onto the base, and pulled up just outside a one-story building -- a temporary space that was being used to interrogate people brought onto base. Several CIA officers and contractors were standing on the driver's side of the car, opposite al-Balawi, and others were standing as far as 50 feet away, a U.S. intelligence official said. Al-Balawi started to get out of the car, with one hand in his pocket, when he detonated the explosives, the source said. "It was no accident that some of the CIA officers were standing on the opposite side," the former intelligence official said. The official observed it was the safest place to be, as "they waited for the Xe guys to do what they're paid to do and frisk him." Also, there could have been some cultural sensitivity, with an Arab man about to be searched in front of female CIA officers who were there. The official says that "there was no point going up to him until after the guards had patted him down." Some of these details were first reported in The Washington Post earlier this week. The official expressed surprise at how much shrapnel tore through the area, killing seven CIA officers and contractors -- including the two Xe Services guards -- as well as a Jordanian intelligence official. Former CIA Agent Jack Rice told CNN that frequently, suicide bombers' explosive vests are wrapped in "things like nuts and bolts and ball bearings. "So what you create is this massive amount of shrapnel that kills everybody in the entire area," he said. Rice, who just returned from Afghanistan, said it was unusual to have so many officers present for a debriefing, but if they believed al-Balawi's claims that he had direct links to al Qaeda's top leadership, the excitement on the base would have been high. "Remember, this is a career opportunity for all of these people. If you could take down al-Zawahiri, if you could take down Osama bin Laden, you are a hero for the rest of your career. Everybody wants to be in the room," Rice said. Al-Balawi, a Jordanian doctor, was a promising potential source. U.S. and Jordanian intelligence agencies apparently believed he was a reformed extremist and were using him to hunt al-Zawahiri. 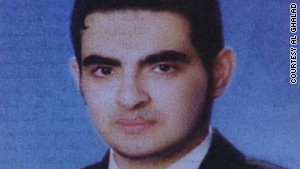 Al-Balawi had provided photographic evidence that helped establish his credibility, a U.S. intelligence official said. There were other things that also helped determine his authenticity, the official added, but would provide no further details. The former intelligence official who spoke anonymously has been to Forward Operating Base Chapman, where the attack occurred, and said body armor was worn even within the base's inner perimeter, which is unusual, compared with military bases in Kabul or Kandahar. "You have a real sense of the proximity to the Pakistan border. Perimeters don't have the same meaning," the official said. While saying that a mistake was made by not searching al-Balawi before he got into the red car, the official defended the officers' decision to bring him on base. "There's nowhere to frisk someone outside, and you don't have a whole lot of options. Let's assume they did have a safe house -- the exact same thing would have happened there," the official said. In a rare public defense of the CIA officers' actions, CIA Director Leon Panetta said the officers did not ignore the potential dangers because of the potential for valuable information. "This was not a question of trusting a potential intelligence asset, even one who had provided information that we could verify independently. It is never that simple, and no one ignored the hazards," Panetta wrote in an op-ed this weekend in The Washington Post. "The individual was about to be searched by our security officers -- a distance away from other intelligence personnel -- when he set off his explosives." The official says the attack not only sheds light on the dangerous work CIA officials and contractors do in Afghanistan, but how their footprint is growing. FOB Chapman was used to conduct operations back and forth across the Pakistan border. But the official says it is just "one of many bases in Afghanistan" that operate outside U.S. military or NATO command. Afghan contractors guard the outer perimeter of many of the bases. "Back in 2005, the CIA worked up an entire plan on how to increase its presence in Afghanistan," the official said. This effort was pursued "very aggressively" through the last several years of the Bush administration, and the official believed President Obama would have been briefed on that when he took office. The official says the feeling in the intelligence community is that Obama has increased the frequency and intensity of aggressive actions around the Afghanistan/Pakistan border region. Since he took office, the United States has ramped up the use of pilotless drones to strike at al Qaeda targets in Pakistan, including at least seven strikes since the December 30 attack at FOB Chapman, and approximately 51 others previously in 2009. In 2008, the last year of President George W. Bush's administration, there were approximately 34 drone strikes. "I've seen no evidence that he's [Obama] diminished in any way the strategy of the previous administration. In fact, President Obama has not only continued what President Bush started, he's built on it," the official said. CNN Intelligence Producer Pam Benson and Pentagon Supervising Producer Adam Levine contributed to this report.